Author: Mathew Owens at the University of Reading. 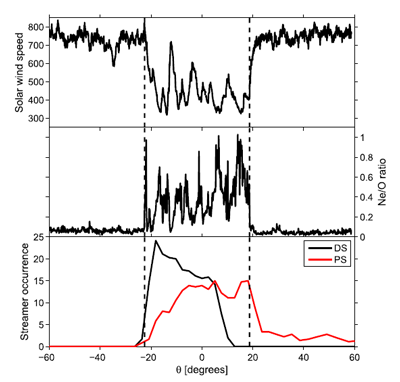 Figure 1: Eclipse observations (bottom) and numerical simulations (middle) of coronal brightness in August 2008. The simulated magnetic field (top) reveals that there are two dipolar streamers and one pseudostreamer. Figure adapted from . Mariner 2 observations of the solar wind in the early 1960s revealed a clear bimodal structure, with recurrent intervals of fast (~750 km/s) and slow (~350-400 km/s) solar wind, separated by alternating compression and rarefaction regions. The Ulysses mission showed that the difference between “fast” and “slow” wind, however, extends well beyond just solar wind speed and plasma properties, to both ion charge states and elemental composition, suggesting fundamentally different formation mechanisms . Fast wind, which originates from dark coronal holes, has a source temperature and composition similar to the solar photosphere, whereas slow wind, which maps to bright coronal streamers, has properties characteristic of hot coronal loops. While the escape of plasma along “open” coronal hole field lines to form fast wind is relatively well understood, there is much debate about how plasma escapes closed coronal loops and subsequently fills a large portion of the heliosphere with slow wind. A number of theoretical models [2, 3] exist in which closed coronal loops are intermittently opened via reconnection with open field lines (so called “interchange reconnection”), thus forming the bursty, hot, slow wind. As interchange reconnection occurs where closed coronal loops encounter open magnetic flux, dipolar coronal streamers — where open flux of opposite polarity converges and forms the heliospheric current sheet and bright coronal features — were thought to be the primary source of slow wind release (Figure 1). However, it is then difficult to explain the large volume of the heliosphere filled by slow solar wind. More recently, pseudostreamers , which involve the convergence of the same polarity open flux, have been investigated as an additional source. Figure 2: A cartoon of interchange reconnection between a closed loop and an open field line. The black arrows show magnetic field polarity, while the red arrows show the anti-sunward heat flux. In the third panel, near-Sun interchange reconnection has opened up a closed loop and produced a heliospheric magnetic field inversion, where the heat flux is locally moving sunward. Heliospheric magnetic flux (HMF) topology can be inferred thanks to suprathermal electrons, which carry the heat flux along the HMF away from the Sun. Occasionally, heat flux is observed to be directed towards the Sun, suggesting the local HMF is twisted back on itself, as expected from a closed loop newly opened by interchange reconnection (Figure 2). These HMF inversions can be mapped back to the Sun, where the location and type of streamers can be routinely inferred from coronal magnetic field extrapolations from the photospheric magnetic field observations. This analysis  shows interchange reconnection regularly occurs at the tips of both dipolar and pseudostreamers, which combine to form a large network of slow solar wind sources across the Sun (Figure 3). Figure 3: An example of the coronal structure for May 2002. The colour map shows the divergence of the magnetic field between the top of the corona and the photosphere, thus the network of streamers are red, while coronal holes are blue/green. The position of the heliospheric current sheet, and hence dipolar streamers, is shown by the white curve. Green crosses show near-Earth signatures of interchange reconnection mapped back to the Sun. They are clearly associated with both dipolar and pseudostreamers. Figure 4: Ulysses observations of solar wind speed (top) and the Ne/O ratio, a proxy for coronal temperature (middle) as a function of heliolatitude for Jan-Mar 1995. The bottom panel shows the occurrence of dipolar (black) and psuedostreamers (red). The latitudinal width of the slow wind band can only be explained by a combination of these two sources. Pseudostreamers are an additional source of slow solar wind. This explains a long-standing mystery about the early Ulysses observations. As Ulysses travelled from the south to the north pole of the Sun in January to March 1995, it observed that the heliospheric current sheet, and hence dipolar streamers was depressed towards the south pole, but the band of slow solar wind was symmetric about the helioequator. The additional northern hemisphere slow solar wind can now be understood as originating from the pseudostreamer network (Figure 4). In fact, there is a strong anticorrelation between the average latitude of the dipolar and pseudostreamer bands, which served to keep the occurrence of slow wind approximately symmetric about the helioequator throughout the solar cycle . Antiochos, S. K., Z. Miki´c, V. S. Titov, R. Lionello, and J. A. Linker (2011), A model for the sources of the slow solar wind, Astrophys. J., 731, 112, doi:10.1088/0004-637X/731/2/112. Fisk, L. A. (2003), Acceleration of the solar wind as a result of the reconnection of open magnetic flux with coronal loops, J. Geophys. Res., 108, 1157, doi:10.1029/2002JA009284. Rusin et al. (2010), Comparing eclipse observations of the 2008 August 1 solar corona with an MHD model prediction, Astron, & Astrophys., 513, doi:10.1051/0004-6361/200912778. Wang, Y.-M., R. Grappin, E. Robbrecht, and N. R. Sheeley Jr. (2012), On the nature of the solar wind from coronal pseudostreamers, Astrophys. J., 749, 182, doi:10.1088/0004-637X/749/2/182. Owens, M.J., Crooker, N.U., and M. Lockwood (2013), Solar origin of heliospheric magnetic field inversions: Evidence for coronal loop opening within pseudostreamers, J. Geophys. Res., 118, 1868–1879, doi:10.1002/jgra.50259. Owens, M.J., Crooker, N.U., and M. Lockwood (2014), Solar cycle evolution of the dipolar and pseudostreamer belts and their relation to the slow solar wind, J. Geophys. Res., 119, doi:10.1002/2013JA019412.